If you’re looking for a unique getaway experience in the Scottish Highlands, consider the AirShip 002, a submarine-inspired, insulated aluminum pod designed by Roderick James Architects. The compact cabin is located in a secluded 4-acre site in Drimnin near the Isle of Mull, with views of the surrounding hills and sea. The AirShip 002 features a galley, double-bed, kitchen, balcony and sitting area, all fitted with essential amenities, electricity and spring water. Both ends of the ship boast domed glass windows, while a wood-lined interior and indoor fireplace ensure a cozy stay. You can book the AirShip 002 on Airbnb now for about $200 USD a night. For more stunning getaways, the Sacromonte Landscape Hotel is a modern vineyard resort in Uruguay. French furniture company Hervet recently launched an exhibition inside Maxfield’s Beverly Hills output in Los Angeles, California. Helmed by co-founders Cedric and Nicolas Hervet, the show displays a stunning selection of handmade pieces in futurist forms. 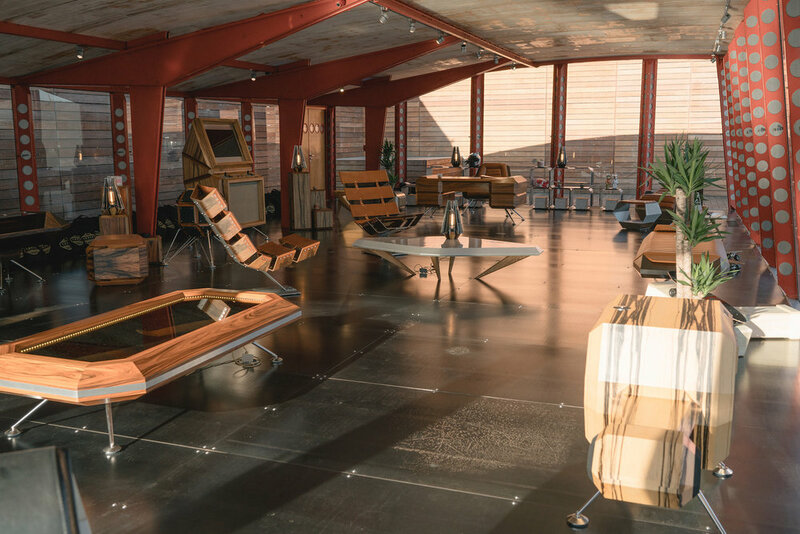 Cutting-edge block desks, coffee tables, and lounge chairs are placed throughout the Jean Prouvé building. 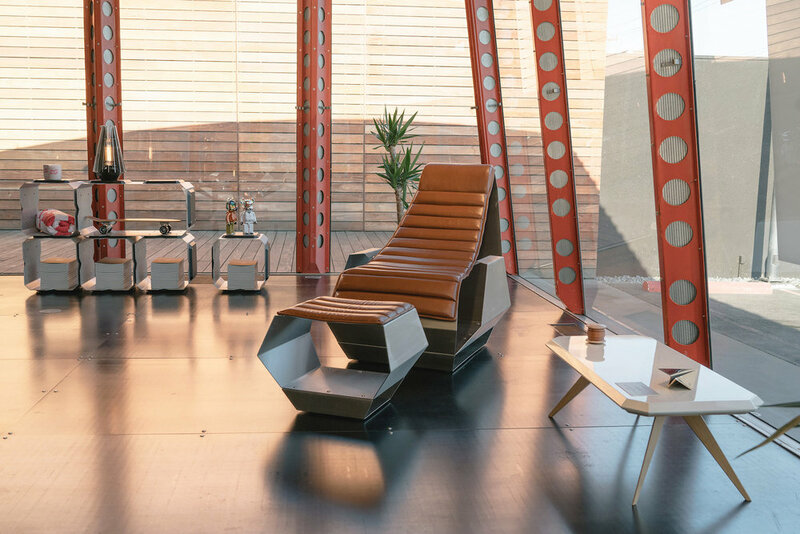 Highlights include the company’s Le Satellite that houses a Bose sound system, Passager armchairs made of steel and full-grain leather, and smaller items such as the Astrolux lamp crafted out of exotic wood as well as Vedette skate decks. All items were built using traditional woodworking techniques such as marquetry and veneering. View the exhibition above and drop by Maxfield LA where the show is open to the public until June 28. Shop select products at Hervet’s official website. In other design news, Raf Simons curated Calvin Klein’s first-ever installation at Design Miami 2018. 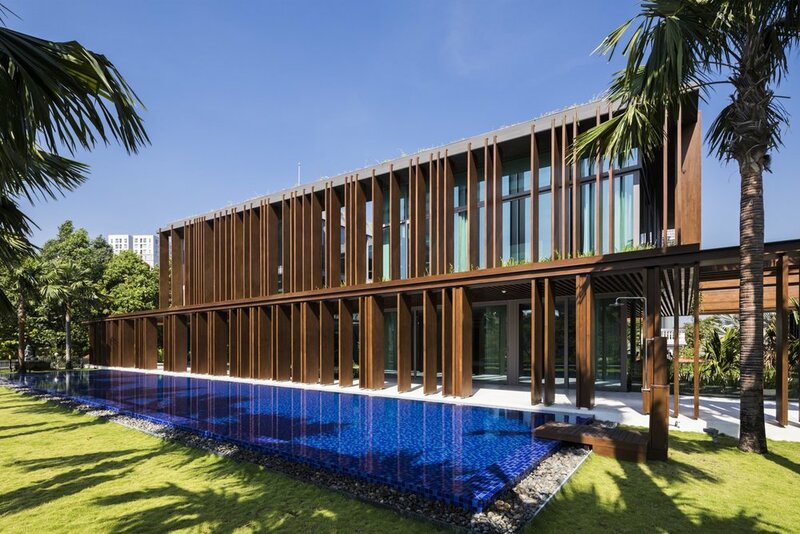 For MIA Design Studio, one of the key requirements was to connect the different zones of the large Louvers House in order to reflect the needs of a modern Vietnamese family. At one end of the house is the bedrooms and living area, while the other end features a spa and gym. To link the different zones, the architecture firm built the space around a shared courtyard that also brings light and air into the middle of the house. Other key features of the house include its first floor living area, which was moved up from the ground floor in order to give the best views across the park lying in front of the house. 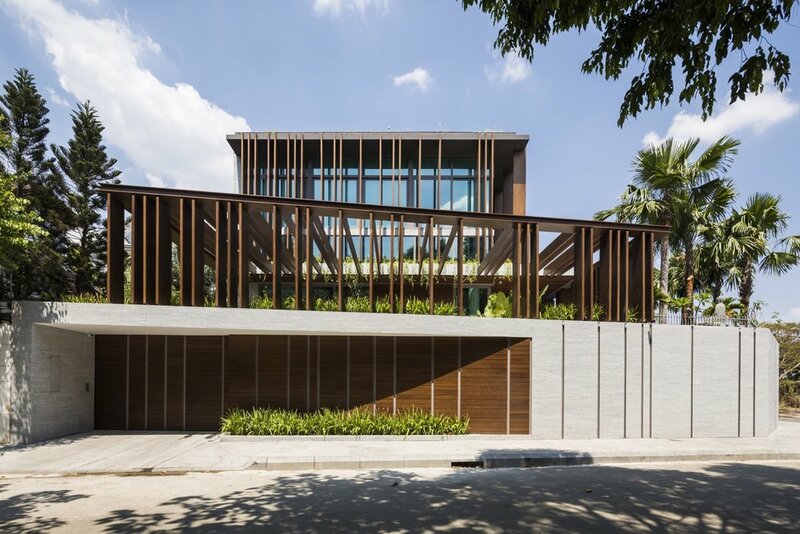 The Louvers House’s location is also an influence on the design of the large canopy, which is needed to keep the house cool from the tropical Vietnamese sun. In other architecture news, take a look at this take on the traditional Finnish log home. Located on the edge of a forest 60km from Saint Petersburg, this house from architecture firm AB CHVOYA was created to blend into its environment. As well as the woodland location, the space is shaped by the plot’s slope and other realities of the area’s geography. Designed for two artists, the building features both a studio space and a residential area consisting of a kitching-living-dining space, three bedrooms and a yoga area. The two zones of the house are linked together with a transit porch. 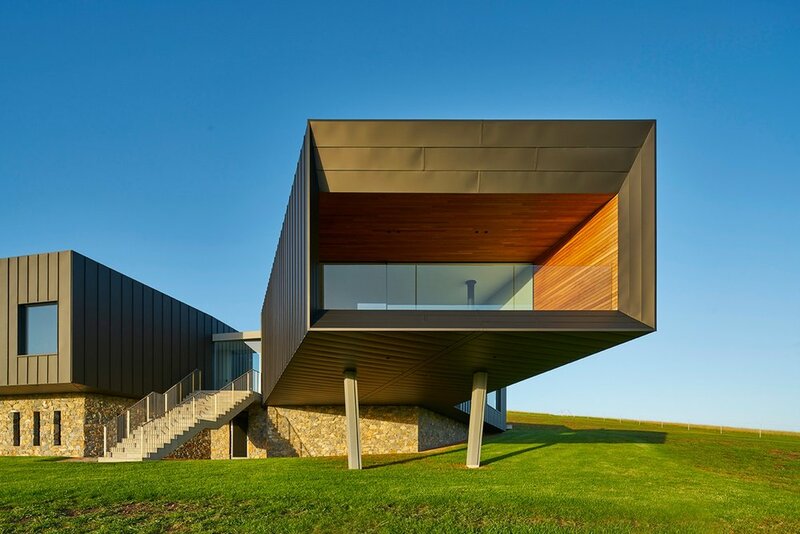 The exterior of the house is clad in carbonized wood, that hides the structure in the forest. Take a look around the house in Roschino above. For more houses, check out the peaceful L20 building in Mallorca, Spain. hufton + crow have just released a new set of images documenting the exterior facade of the now completed 520 West 28th building by Zaha Hadid Architects. Proposed in 2013, the luxurious condo complex houses 39 units — priced between $4.95 million and $50 million USD depending on the size — and is brimming with the architect’s signature use of curves, and choice of material. As the first completed project in the city, the building is situated in an ever-growing neighbourhood, which sees a number of art galleries and restaurants, but with amenities like an IMAX cinema, large gymnasium, swimming pool, and extended outdoor section, the building is more than well equipped for a night in. For more ZHA projects going on in the world, check out this alien-like cultural hub that’s set for construction in UAE. Ahead of the 2022 Winter Olympics in Beijing, architecture studio Penda has designed a new bridge connecting Beijing and neighboring city Zhangjiakou where some of the outdoor Olympic games are slated to take place. Inspired by the five Olympic rings, the structure consists of a series of overlapping arcs made from tubular stainless-steel struts. The shape also pays homage to the nearby mountains, which led to the name San Shan Bridge (translated as Three Mountains Bridge). The 452-meter bridge adds an inviting context toward the mountainous scenery of Zhangjiakou, as envisioned by architects Chris Precht and Dayong Sun. The helix construction provides structural support similar to a roller coaster, while using five times less steel than a regular box-girder frame. Finally, a row of hedges and trees create divisions on the deck separating pedestrians and cyclists from cars. If the project is approved, it will spearhead a system of upgrades for Beijing’s preparation of the Winter Olympics. Interior renderings have been released for the One Thousand Museum, a skyscraper in Downtown Miami that is just one of the many projects started by Zaha Hadid before her untimely passing. The 62-story tower features a contoured exterior, and a structurally strategic exoskeleton which has left the building almost entirely column-free and open. The luxurious residence also includes its own private helipad, a two-story aquatic center and sky lounge, a duplex penthouse, several full-floor penthouses, half-floor residences, townhouse residencies, indoor and outdoor spas, and a sculptural sun and swim terrace. Every detail of the building has been thoughtfully planned, including it`s location. 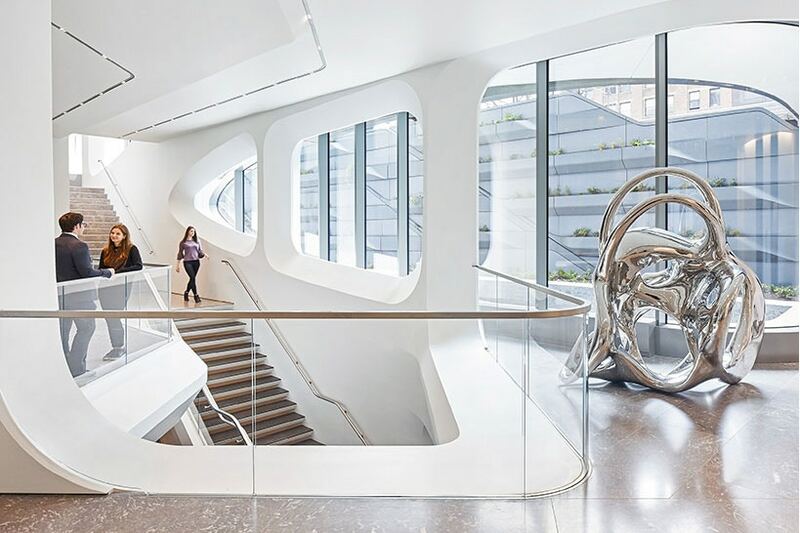 The One Thousand Museum neighbors other stunning architectural feats such as the Perez Art Museum, the Patricia and Phillip Frost Museum of Science, and Frank Gehry`s New World Symphony, while overlooking Museum Park and Biscayne Bay. The skyscraper will be completed posthumously, with expected completion in 2018. Dutch architectural photographer Iwan Baan traveled to Harbin in the midst of one of its infamous winters — where temperatures drop to a bone-chilling -30°C (-22°F) — to capture the building as encased by the throes of snow and ice, lending even more to its otherworldly aesthetic. Roman and Williams, the firm behind Ace Hotel New York, The Boom Boom Room, and the Standard Highline, adds another name to its impressive resume with the unveiling of the Fitroy. The latest addition to New York’s luxurious High Line residences is a beautiful 10-story building clad in green terracotta and copper-clad oak, boasting 14 residences that rival any 5-star establishment. Ranging from two to five bedrooms, the homes have been furnished with chevron oak floors, north and south exposures, custom marble counter tops, and copper bathroom fixtures. Other amenities of the building include a secure wine locker, storage room, fitness center, rooftop lounge, and a 24-hour concierge. With prices ranging from $5.3 million USD to $15.8 million USD, head over to the building’s homepage for more information. Let’s get one thing out of the way right off the bat: no, this house isn’t called the “Antsy Plum House,” as cute as that may sound. Rather, the house is located in and named after the idyllic village and civil parish of Ansty, England. The house itself was originally built in the ’60s on a steep, sylvan slope overlooking a collection of 12th century buildings. The home was originally built for Danish-British civil engineer Ove Arup and included a separate studio for the homeowner to work in. Over the years, water damage, decay and disrepair ate away at the house. 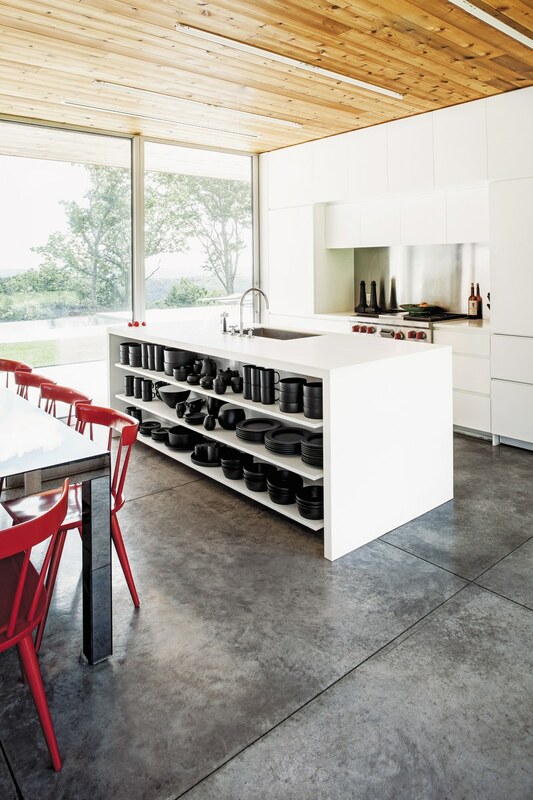 The architects at Coppin Dockray, however, saved the day and retrofitted the entire original structure, repairing and retouching the home to preserve it. 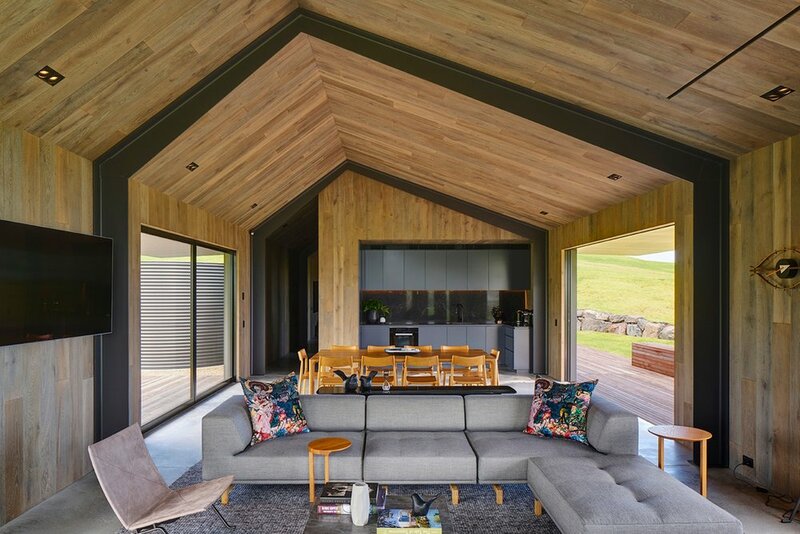 The renovations included an overhaul of the building’s insulation, which resulted in an 80% reduction in carbon emissions and eventually landed the architects a shortlisting for an AJ Retrofit Award in 2015 and the award for ‘Best Renovation’ in the 2015 Telegraph Homebuilding & Renovating Awards. Step into artist Cai Guo-Qiang’s personal headquarters in downtown New York City. Its recent renovation and expansion sees historic elements from the building juxtaposed against newer materials of translucent resin. A resin-built wall is the central spine of the building and not only distributes natural light to multiple studios but references Cai’s work of unfolding different scenes on a common space. On the cellar level, we see a library, filled with the artist’s collection of publications, and a traditional tea room for reception. The building is a masterful site-specific approach to the cultural backdrop of Cai’s artwork. Get more information about the artist here. 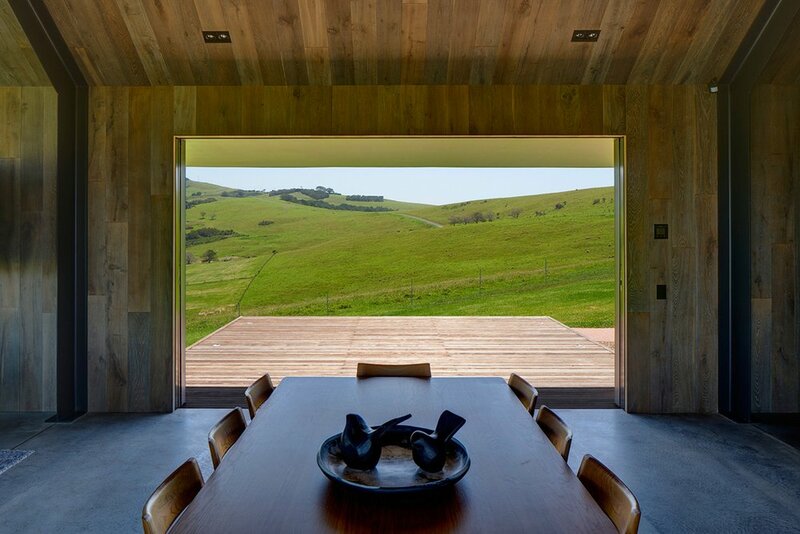 The Djerassi Resident Artist Program is tucked into the Woodside, CA’s Bear Gulch, providing writers and creatives alike with an oasis of privacy. The Diane Middlebrook Studios (informally known as the Writers Cabins) offer the ultimate remote hideaway — free of technology, Internet, social media and distractions. The four units face South-west with breathtaking views of the Pacific Ocean. The units also feature private balconies, red cedar exteriors and a steel canopied roof. For added privacy, the units are even skewed away from each other to allow shut-in novelists to work completely devoid of distractions. If sustainability is more your thing, check out this house in the hills of Mexico that creates the illusion of living amidst the forest. After a couple of years on the market and with many price drops, Pharrell’s Miami penthouse is back on the market. Located at the top of the Bristol Tower in Miami’s Brickell neighborhood, the 9,000-square-foot residence includes everything from an open cathedral-like living room, a second-floor loft space, spiral staircase, library, private screening room, 5,000 square feet of outdoor terraces, and five bedrooms in all. The penthouse even features an “opposite fishbowl effect” — meaning those inside can see out of the windows, but nobody can see in.Current asking price? A cool $10.9 million USD. But hey, it’s better than the original asking price of $16.8 million USD back in 2012. This serene 520 square meter home was designed with nature in mind, creating a very open and bright space. The Greenbank Park semi-detatched home perfectly fuses modernity with wooden accents, exuding zen and serenity. 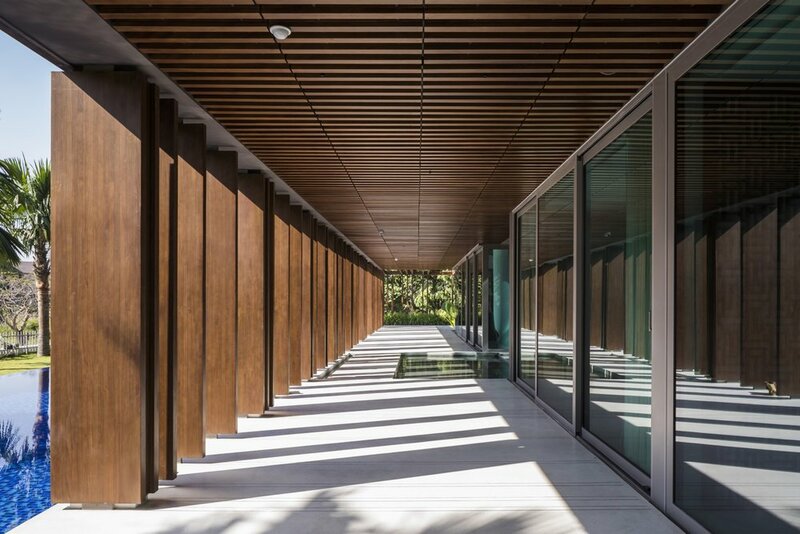 With an open courtyard sitting on two levels, natural sunlight fills the entire property, On the first floor, a frangipani tree sits in the middle of a pond, framed by a timber box while a double volume living and dining room wraps around the courtyard. On the second floor is the master bedroom in front of interlocking vertical and horizontal timber which encloses a glass facade facing the open courtyard. Check out the space and let us know what you think.